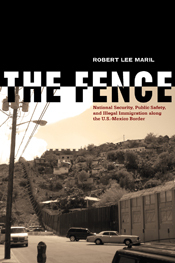 The Fence: Human Smuggling, Terrorists, and Public Safety along the US Mexico Border, Robert Lee Maril, Texas Tech University Press. March, 2011. Putting the human equation first, Lee Maril brings thirty years of personal observation and investigation to bear on the proposed and highly politicized ″solution″ to border problems: the Fence, all 2,000 miles, in all its iterations, physical and virtual. In language accessible and appealing to general readers, Maril employs inductive methodology based upon participant-observation, interviews, and an analysis of local, state, and federal government documents from 1999 to the present. Avoiding preconceived conclusions, the author suggests specific public policies requiring thoughtfulness of the human issues involved, political negotiation, and inevitable compromise. Maril interviews border residents, educational leaders, rank and file Border Patrol agents, county officials and many others in border organizations and institutions seldom questioned. He also talks at length with major defense contractors, military leaders, national politicians, environmental activists, and Minutemen. Even as the drug violence mounts in border cities and illegal migrants die in increasing numbers from heat exhaustion in the Arizona desert, Maril documents how Congress repeatedly fails to provide oversight of hundreds of millions of federal tax dollars in fence construction. The new border fence between Mexico and the United States is, Maril shows us, a fundamental symbol in concrete, steel, microchips, and fiber optics for all that is both right and wrong with contemporary immigration policy, national security, and public safety.